I spent some time this week putting together new models, stripping old models, converting and re-converting, and re-assembling stripped models into new squads! Not much painting getting done, but I am hoping to finish up my Feb 2010 painting resolution this weekend as well. I ordered the remaining resin bases for my entire army this week as well! Now all I have to do is paint the whole thing. New pics this weekend for sure. Here is what I am looking at either assembled or sitting in Simple Green. I'm waiting on the new GW plastic Venerable Dreadnought for more Dread weapon arms and options, and another Dreadnought option. Even then I still may get the FW Venerable Dreadnought. It's an excellent model. I also have 2 full Space Marine Tactical Squads I am stripping to split up for bits. I may use them for more special and heavy weapon options, or to fill out my current squads, or both. I have another 10 Terminators I am breaking up (5 reg, 5 AoBR) that I may use all of my bits to make into regular Wolf Guard in terminator armor as well. Just in case I ever wanted to play a Wolf Wing list. 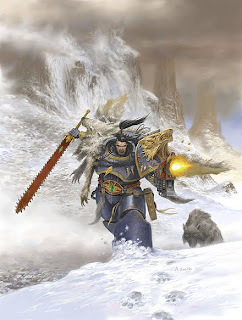 I've been looking at my options for Thunderwolf Cavalry lately, and I was thinking about adding some Land Speeders with Typhoon missile launchers and at least 1 twin-lascannon Razorback. I definitely need a Ragnar Blackmane model. But right now I need to get to work on painting first. They carry Forgeworld products at my local gaming store Pandemonium, so I will at least wait until they restock it. Then I will drool over it and eventually buy it.